ELISABright Substrate: Make Your ELISA Shine - Advansta Inc.
Chemiluminescence isn’t just for Western blots. You can make your ELISA shine too by using an ELISA substrate that produces light. 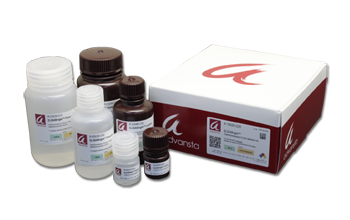 In fact, we have the perfect substrate for sensitive, chemiluminescent-based detection for your ELISA assay: Advansta’s ELISABright. ELISABright outshines other leading products with the highest signal-to-noise ratio on the market – 6 times greater than the competition! ELISABright, SuperSignal® ELISA Pico and SuperSignal ELISA Femto substrates (Thermo Fisher) were used to develop replicate sandwich-style ELISA assays. Signal-to-noise ratios for detection of wells containing 50 microliters of a 500 pM solution of C3 protein are shown. 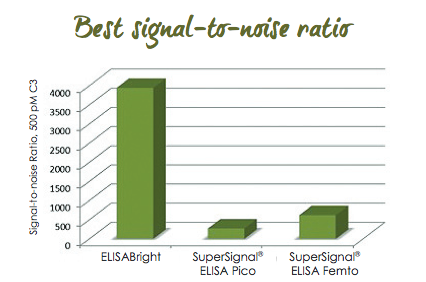 ELISABright demonstrates a signal-to-noise ratio 6-times higher than the competition. A higher signal-to-noise ratio means you will finally be able to detect that low abundance protein and save money by using less antibody in your assay. ELISABright has a dynamic range that you should expect from a superior product – a linear range broad enough to give you an extensive standard curve and allow precise measurement of your protein concentration. 96-well microtiter plates were coated with purified anti-C3 antibody. Serial dilutions of human C3 protein from 7.81 to 500 pM were added to ELISA plate, followed by blocking and adding a monoclonal anti-huC3a detection antibody. Post-incubation the diluted (1:30,000) goat anti-mouse-HRP conjugate was added and plate was developed by using 100μL of ELISABright substrate (components mixed 1:1) per well. ELISABright produces a signal linear with respect to the target protein concentration, with R 2 values approaching 1. Don’t stand around waiting for the lights to come on, add our substrate and immediately read your plate. 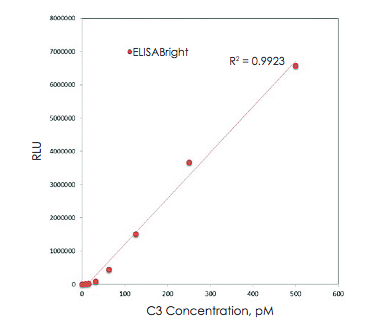 Chemiluminescent ELISAs generally require 2-10x less reagents than colorimetric detection. And ELISABright’s sensitivity means you will use even less antibody – saving you (or maybe your PI) even more money. 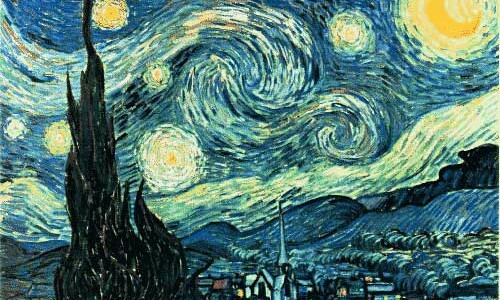 So make sure you are reaching for the stars with your ELISA and try some today!